First the Oregon women. Wow, I didn’t see that coming! Oregon just destroyed Stanford, busting the three-decade losing streak at Maples Pavilion to pieces. Let’s talk about why they’re so dangerous right now. 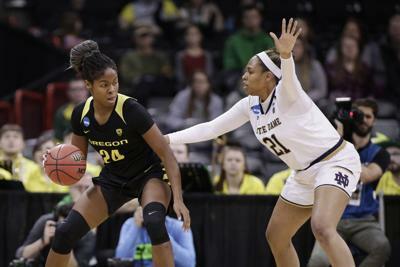 It’s not just Sabrina Ionescu and Ruthy Hebard; Satou Sabally and Erin Boley are starting to play like All-Americans. Does Boley ever miss when she gets her feet set from behind the arc? And Sabally is nearly unguardable at times. She’s too tall to defend at the three-point line, and too quick to stay in front of on the block. Ruth Hebard leads the nation in field goal percentage. And wow, can they ever shoot! 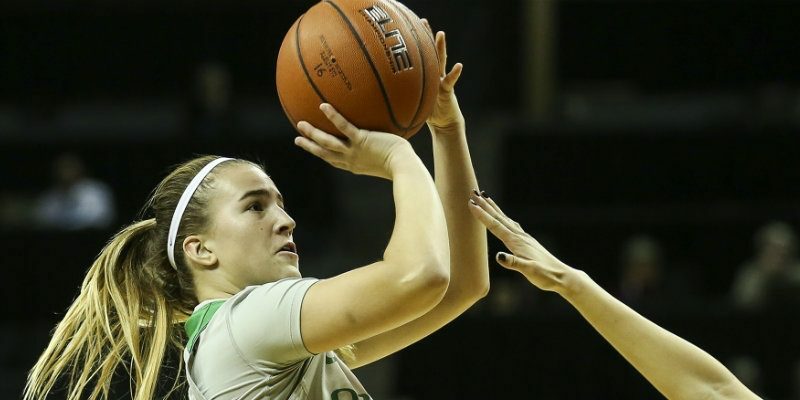 Oregon is shooting just under 43% from the three-point zone, which leads the nation. It also leads the nation in assist-to-turnover ratio, and Hebard leads the nation in overall shooting at 71.2%. So, they get a shot on every trip. Watch the approach to shooting by Boley, Sabally, Ionescu and even Taylor Chavez when she comes in. They run the wing on the break, and just after crossing half court they take a little outside run at the sideline. Then they come back in toward the basket. This squares their shoulders to the hoop as they catch the ball. It’s subtle, but when they make that little turn their jump stop leaves them perfectly squared up to go up with the shot. Catch and shoot, right off the fast break. Oregon is really well coached. When you beat a team like Stanford on the road by 40 there’s not much left to say. 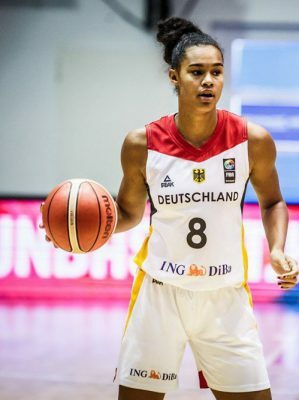 Satou Sabally is on the Cheryl Miller Watch List for the nation’s best small forward and may win it. Oregon looks like the most dominant team in the country. How dominant? The Ducks have nine wins by 40 or more, and eight more by 20 or more. That means they have 17 wins by at least 20. And they’ve only played 24 games all season. The schedulers weren’t kind to them this week though. Beating Oregon State won’t be easy, and playing them twice in four days is brutal. First things first: would everyone please show up at Matthew Knight Arena on Friday to support them? They deserve a sellout. 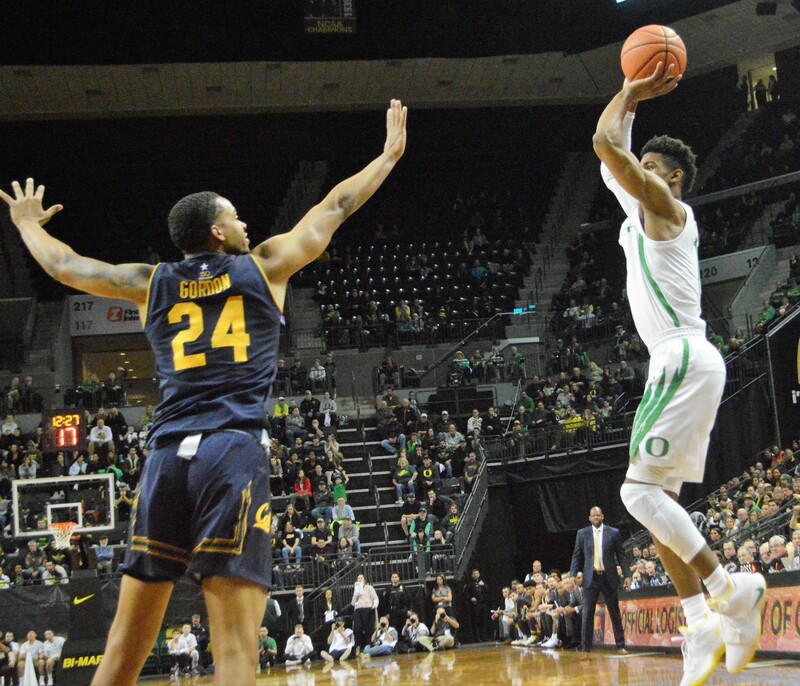 If the Ducks can beat Oregon state twice, they’ll be in the driver’s seat for the number-one seed in the West. They’re currently a number one according to the latest Bracketology released Monday. Kenny Wooten’s seven blocks against Stanford are going to get the most attention, but I liked how the Oregon defenders funneled the dribbler toward the edge of the backboard. A little angle away from the rim gives shot blockers like Wooten an angle. I just wish he’d block it toward one of Oregon’s guys instead of spiking it each time. Bill Russell used to talk about how you have to just tap it back and toward one of your guys or to the wing so you have a chance to use it as an outlet pass. Most of Wooten’s blocks go into the third row. Exciting to watch, but not quite as helpful for the Ducks. Wooten often arrives to the shooter so early, and with so much time to think, that you have to believe he can block it toward the wing. Offensively Oregon’s still a disaster on some possessions. After they burn 20 seconds of clock not doing much, teams jump out and double team the dribbler, and they wind up shooting some bad shots. They’re not setting strong screens and their spacing isn’t good. Players don’t move to the open spots when the ball goes into the paint. And when they do get good shots, well, again … they’re not a good shooting team. Bailey is a rhythm shooter who thrives when he gets his feet set. I think I see VJ Bailey’s best shooting spot. It’s just two feet toward the baseline from where the three-point line starts arcing toward the center of the court. If he plants his feet and goes straight up from that spot, on either side, he is terrific. I’ve watched him in warmups and in games. I don’t even know if he sees it because he’s not always trying to get to that spot. But when he does, he’s solid. Honestly, Bailey should watch film of Boley and how she sets herself up to catch and shoot. Her mechanics are terrific. Payton Pritchard continues to demonstrate his guts and determination. He just refuses to quit. Rooting for him is easy. The bad news is that Louis King hasn’t emerged offensively as the go-to guy every night. That’s also good news if you don’t want his NBA stock to soar and want him to return next year. Oregon needs eight more wins to get to the dance. A 15-9 record is bad at this point in the season when it needs to be at least 18-6. The Ducks need to go 6-1 the rest of the way in conference and win at least two in the conference tourney. Then they’d be 23-11, and most likely right on the bubble. That’s how little margin of error there is for this group. It wasn’t pretty against Cal or Stanford, but the Ducks’ D was stifling in both games this week. Oregon was 70th in the NCAA Net standings as of Sunday afternoon. It probably needs to be in the 50s to have a chance for the big dance. Reality says Oregon doesn’t have enough offense to win eight out of 10 down the stretch to make an argument for the tournament. Their defense is more than good enough, but they just don’t have enough shooting.